BATH, UK — The small city of Bath, situated about an hour west of London by train, has over time become a symbol of classic English gentility, mainly due to its grand and elegant Regency buildings and its associations with the novels of Jane Austen. 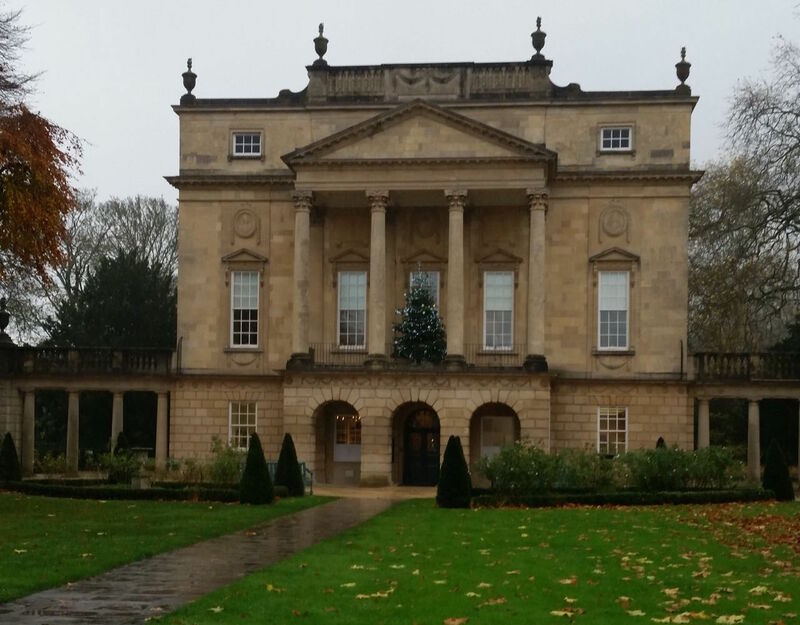 At first glance, the Holburne Museum conforms to the pattern. The building was finished in 1799 for Sir Thomas Holburne, a steely-eyed admiral in the British navy whose portrait is part of the collection that is now displayed in his former home. There are paintings by Gainsborough, Stubbs, and Reynolds, most of which portray the moneyed and titled classes of those times smugly enjoying the fruits of their privileges (strolling through their pleasure gardens, riding a favorite horse, wearing fantastically expensive clothes). There are thousands of bits of porcelain, portrait miniatures, old coins, snuff boxes, and so on — the things that I always walk quickly away from, though I acknowledge they should be preserved. All, as I say, supporting the impression that you’ve just wandered by mistake onto the set of the TV show Downton Abbey. 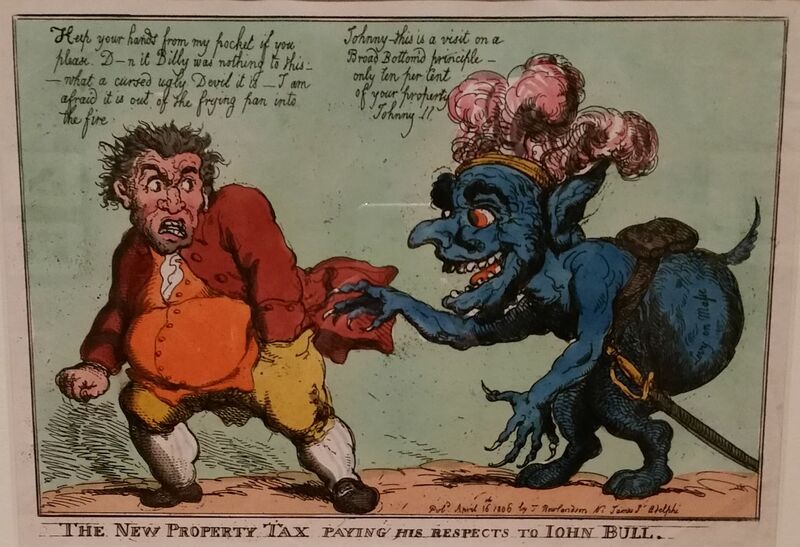 But there is a temporary exhibition on display at the moment of prints by the caricaturist Thomas Rowlandson that undermines that whole myth of “Heritage England,” even though the art has its roots firmly in the world of the late 18th and early 19th centuries. Rowlandson (1756–1827) got some art training at the Royal Academy, and turned to cartoons as a way of making money after he squandered a big inheritance at the gaming tables of London. This kind of rakish behavior is one of the things he satirizes in his cartoons, but in most of the works in this exhibition, his target is more generally the mismatch between how people see themselves and how they might be seen from the outside. In the political realm, the antics of politicians or the Prince Regent are held up for ridicule. 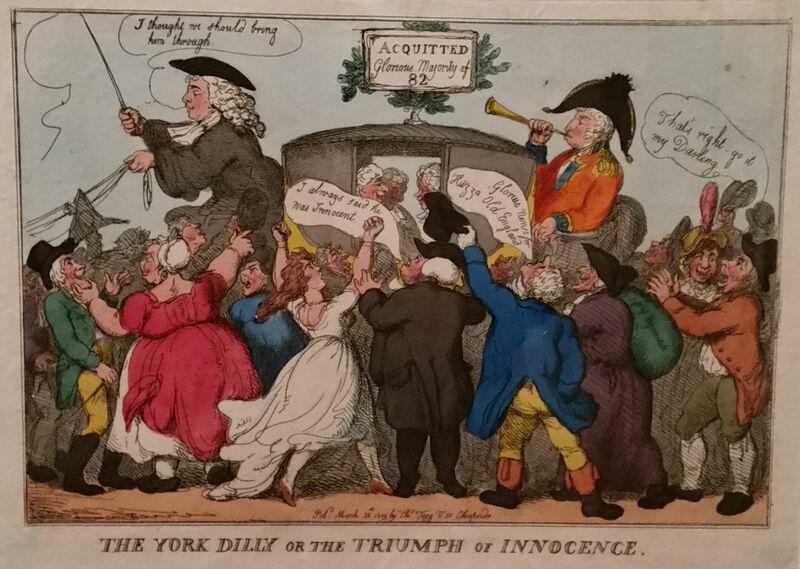 We may not know the specific controversies that roiled England in the 1790s, but we certainly recognize the type of things Rowlandson is laughing at: the Duke of York being mocked by a crowd, or politician Charles Fox being mocked for his wordiness. A lot of the humor is based on discrepancies of size, such as very big men and very small women — a joke as old as time itself. Even when the targets are what we would now consider beyond the pale (sick people, foreigners, and especially the French), the prints can still be appreciated for the brilliant skill of the drawing. Like his near contemporaries James Gillray and George Cruikshank, the basis of Rowlandson’s style is the exaggeration of facial features. But there is a circular, swelling line in almost every shape that imparts an arresting energy to the prints. And prints is what they are: etchings on copper or steel, which were colored by hand, sold in London print shops, and collected enthusiastically, even by their targets (the Prince Regent, later King George IV, amassed a big collection of Rowlandson’s prints). 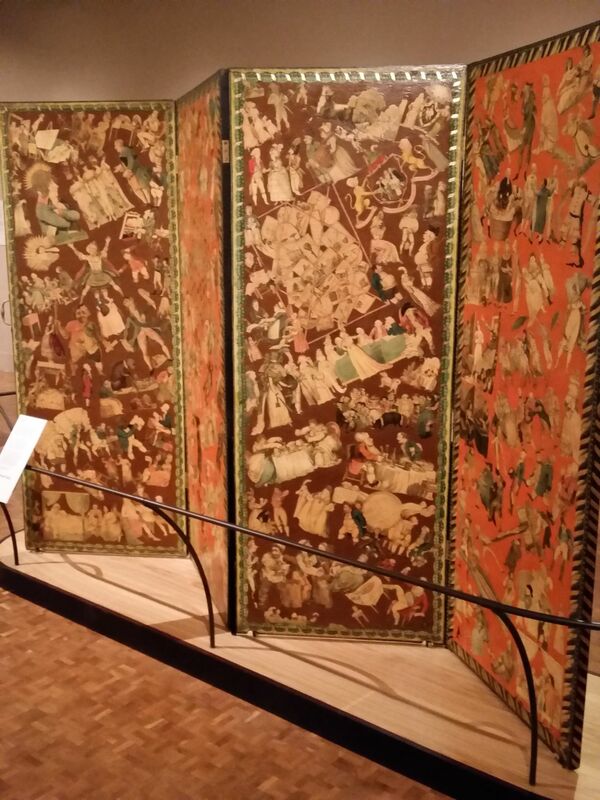 People liked them so much that they would even paste them onto folding screens so they could glance at them while taking tea with visitors (one such screen, from the late 19th century, is on display in the main room of this show). There’s a long line of savage political cartoons in British history that continues to this day, preeminently in the work of Steve Bell for the Guardian. 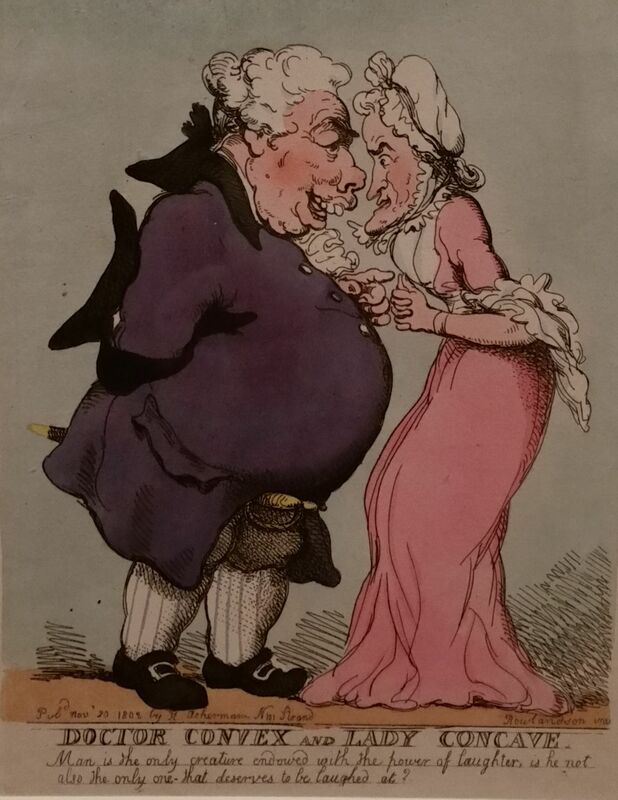 Like Bell, Rowlandson’s work is a reminder that saying rude things and jeering at hypocrisy are vital antidotes to the stifling atmosphere of societies ruled by politeness. 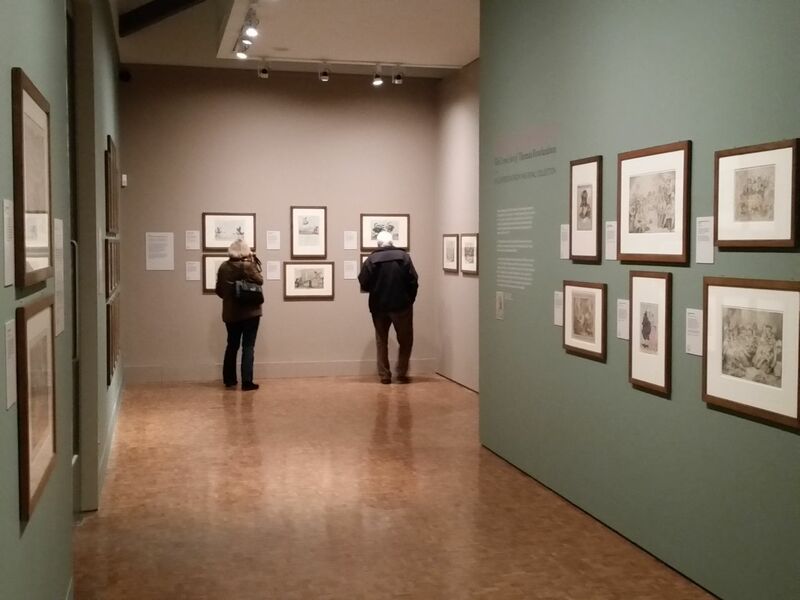 High Spirits — The Comic Art of Thomas Rowlandson continues at the Holburne Museum (Great Pulteney Street, Bath, UK) through February 8, 2015.